Microsoft is busy preparing a second update to Windows 8.1, but the company is largely focused on a larger "Windows 9" release due next year. ZDNet reports that a preview of codename Threshold — which may or may not be named Windows 9 once it’s released — will be available later this year. The public preview is said to arrive in the fall, shortly after Windows 8.1 Update 2 is delivered to existing machines. Microsoft had been planning to bring the Start Menu back with Update 2, but the company is now planning to deliver that change with Threshold. While Microsoft has started to move away from the Start Screen for desktop PCs with Windows 8.1 Update, it appears that it will go further in the "Windows 9" release. Sources familiar with Microsoft’s plans tell The Verge that the company is testing versions of Windows that enable the Start Menu by default on desktop machines, and hide the existing Start Screen from use. The Start Screen can be re-enabled in Microsoft’s test builds, and it’s believed that the company will keep this option for desktop users who prefer the tiled Start Screen. Microsoft originally revealed a concept for its upcoming Start Menu at its Build developer conference earlier this year, and the final version will ship with a more refined interface. The concept includes Live Tiles floating in the Start Menu, providing access to traditional and "Metro-style" applications. Microsoft is also planning to allow "Metro-style" apps to float on the desktop in windows, much the same way that traditional x86 applications do today. Both changes are planned for "Windows 9," and a separate combination of Windows Phone and Windows RT will provide the basis for a mobile version designed without a desktop mode in place. Meanwhile, Windows 8.1 Update 2 is expected to arrive as part of Microsoft’s monthly security patches in August. The update will include the usual bug fixes, and improvements for upcoming hardware ahead of the holiday season. Windows' 8.1 Update included a number of interface changes and functionality tweaks, and Update 2 is expected to include some additional minor interface tweaks. believe it or not, i was excited for windows 8 and 8.1, both are good, i don't mind either one of them. 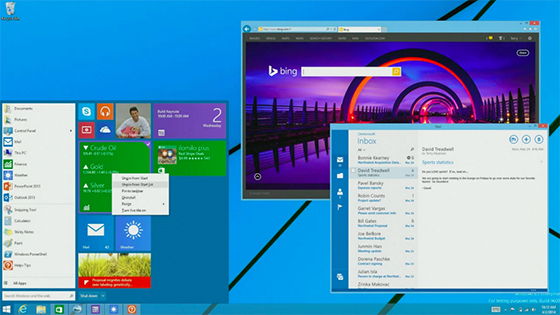 but this actually does not excite me at all, that start menu doesn't look good. I know people might look at it thinking about it's speed and stuff, but let's be honest, graphical interface plays a big role in the OS acceptance, this is why every OS has a new look which will attract customers, this one atleast in my opinion doesn't. Also why would i want to run metro apps in a window?